This article is about the sitcom. For the episode of American Horror Story: Cult, see Charles (Manson) in Charge. Baio starred as Charles, a college student attending the fictional Copeland College in New Brunswick, New Jersey, who finds a unique living arrangement with a family in need of a caretaker for their young children. The show also starred Willie Aames as Charles' best friend Buddy Lembeck. The series premiered on CBS on October 3, 1984, and aired initially on Wednesday nights at 8 PM paired with another new sitcom, Dreams. Facing off against two hits in ABC's The Fall Guy and NBC's Highway to Heaven, neither show performed well and Charles in Charge was moved to Saturday nights after the cancellation of Dreams. CBS eventually decided to cancel the series after it made no improvement in the ratings after its move to Saturday, and Charles in Charge aired its final episode on April 3, 1985, in its original time slot. 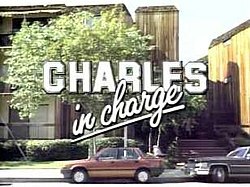 At the time of CBS' decision to cancel Charles in Charge, a trend had emerged where network series, especially comedies, would find new life in first-run syndication after cancellation. Universal took advantage of this and relaunched Charles in Charge in syndication. The first new episode premiered on January 3, 1987, and four more seasons were produced before the show came to an end again on November 10, 1990. When the series premiered, Charles had just taken a job with Stan and Jill Pembroke to help care for their three children, sons Jason and Douglas and daughter Lila. In exchange for his services, the Pembrokes provide Charles with room and board. When the show returned in 1987, the Powell family was living in the home; the Pembrokes had moved to Seattle and had agreed to sublet the house, which included allowing Charles to continue living there. The family retained Charles' services as well, and he became caretaker for Ellen Powell's three children, son Adam and daughters Jamie and Sarah. In addition to them, Ellen's father-in-law Walter moved into the home to serve as his grandchildren's father figure; Ellen's husband was a Navy officer who was often on duty and thus rarely saw his family. Charles' mother Lillian, who had not been seen in the initial series, became a more central figure in her son's life when the show moved to syndication as well. Michael Pearlman and Jennifer Runyon are the only other actors, besides Baio and Aames, to reprise their roles on the show. Pearlman appeared in the second-season premiere, "Amityville". (Lisa Donovan played Jill Pembroke in that episode.) Runyon appeared in "Twice Upon a Time (Part 1)" and "Twice Upon a Time (Part 2)". In the final two seasons, Sandra Kerns only made three more appearances (once in season 4 and twice in season 5). Charles' mother, Lillian, was played by Ellen Travolta, John Travolta's sister. She also played her sisters (Charles's aunts), Sally and Vanessa. She had previously played the mother of Chachi Arcola, Scott Baio's character on Happy Days and Joanie Loves Chachi. Chachi's real name, incidentally, was also Charles. Nicole Eggert went on to star in Baywatch (1992–1994). Josie Davis also made one appearance in a 1998 Baywatch episode. Both Charles in Charge and Baywatch were TV shows that began on network TV, before moving to first-run syndication. Eggert has since accused her co-star Scott Baio of sexually harassing and sexually abusing her as a minor, beginning at age 14. She said she kept quiet because she wanted to protect the show. Baio has denied all her claims. Baio has said that they engaged in a one-time consensual sexual encounter when Eggert was 18, which Eggert initiated. Eggert has said that she was 17, and that Baio initiated their encounter. Baio and Aames are the only two cast members that appear in every single episode. The theme song was composed by David Kurtz, Michael Jacobs, and Al Burton, and performed by Shandi Sinnamon. The theme music was mellower in the first season, and was remixed for the syndication run. Universal Studios Home Entertainment released a 3-disc set of the first season of Charles in Charge on DVD in North America on February 14, 2006. Due to poor sales, no further seasons were released. In September 2007, it was announced that Arts Alliance America (which subsequently changed its name to Virgil Films & Entertainment during the summer of 2007) had acquired the rights to the series. They subsequently released seasons 2–5 on DVD. Seasons 4 and 5 were Manufacture-on-Demand (MOD) releases, available exclusively through Amazon.com. All five seasons of the series were made available for streaming through Amazon Video and season one only on Hulu Plus. In addition, the entire series can be streamed on the NBC.com app. ^ "Charles in Charge – The Complete First Season DVD Review". Sitcoms Online. Retrieved March 25, 2009. ^ "Charles in Charge (TV Series) Overview". Allmovie. Retrieved March 25, 2009. ^ a b c d Rosenblatt, Kalhan (January 30, 2018). "'Charles in Charge' actress Nicole Eggert says she hid Scott Baio abuse claims to protect show". NBC News. Retrieved February 4, 2018. ^ a b c Rao, Sonia (January 31, 2018). "Scott Baio denies former castmate Nicole Eggert's accusations of sexual misconduct". The Washington Post. Retrieved February 4, 2018. ^ a b c d "Nicole Eggert Reasserts Scott Baio Sexual Abuse Claim". Time. Associated Press. February 1, 2018. Archived from the original on 2018-02-04. Retrieved February 4, 2018. ^ "Charles in Charge DVD news: Announcement for Charles In Charge - The Complete 2nd Season - TVShowsOnDVD.com". Archived from the original on 2012-04-19. ^ Where Does the 4th Season of the Scott Baio Series Currently Stand? Archived 2009-02-08 at the Wayback Machine TVShowsOnDVD.com. January 28, 2009.